On October 31, 2018, Mitsubishi UFJ Trust and Banking Corporation (“MUTB”), a wholly owned subsidiary of the cross-listed Mitsubishi UFJ Financial Group (“MUFG”), and one of Japan’s leading asset managers, came to an agreement with the Commonwealth Bank of Australia (“CBA”) to acquire its global asset management unit, Colonial First State Global Asset Management (“CFSGAM”), for a price of US$2.93bn (A$4.13bn). The deal occurred soon after CBA’s stated – back in June 2018 – intentions to demerge the above-mentioned division in order to focus on its core banking activities, while MUTB thereby found the perfect target to beat domestic competition and join the Top 15 Money Managers club. Established in 1927, MUTB is not just a wholly owned MUFG’s subsidiary, it is rather a pillar of the Japanese banking giant’s corporate structure, now active in the business for almost 100 years, employing over 12,800 professionals and with consolidated total assets amounting to ¥46.6tn, as of March 31st, 2018. MUTB service portfolio includes a variety of high-quality and comprehensive services, ranging from commercial banking to asset management and administration, as well as from real estate to stock transfer agency services. Its business model is organized according to an “in-house company” management scheme that builds up on four business units: Retail Banking (16% of FY2017 gross revenues), Asset Management & Investor Services (38%), Markets & Global (18%) and Corporate (28%). MUBT’s Asset Management business started to manage corporate pension funds back in 1962 to settle today among Japanese market leaders. With 250 professionals managing approximately $430bn as of March 31st, 2018, the division is highly specialized on corporate, public and financial institutions’ pension funds, offering both pooled and segregated investment solutions, benefiting from an extensive product portfolio and MUFG’s strong sales network. MUFG’s financial report for the year ended March 31st, 2018 (FY 2017) highlights decreasing net operating profits (-12.3% YoY), with the only increases reported by Retail Banking and Asset Management & Investor Services. More specifically, the latter reported an increase in net operating profits of ¥8.9bn, attributable both to the new inflows recorded after successful efforts specifically meant to increase the size of assets under management (“AUM)” have been made and to rising stock prices. Born in Australia in 1988, CFSGAM – globally known as First State Investments – has nowadays grown into a large-scale asset manager with approximately $213bn in AUM, as of June 30th, 2018 and about 800 professionals located across 11 offices in Asia, Australia, Europe and North America. The asset management firm heavily relies on foreign markets, assets and investors, with 70% of the business nowadays conducted outside the home country. For over 18 years, CFSGAM has been part of CBA’s group, while always preserving its independence, both in terms of clients and services portfolios. However, in June 2018, CBA stated its intentions to demerge CFSGAM. The move can be included in the wider plan foreseeing the divestiture of other wealth management businesses to be completed by the end of 2019, aimed at getting rid of its non-core assets. CFSGAM builds its activities around a sustainable and responsible investment strategy, searching investment solutions that evolve reflecting the real-world impact of their issuers – being them Governments or businesses – and carefully evaluating environmental, social and governance factors on the road towards their investment decisions. Currently, CFSGAM is made up of 17 teams actively operating across Equities, Fixed Income, Alternatives and Multi-Asset and it is also equipped with a passive investment strategy – named Realindex Investments – focused on the continual refinement of the firm’s systematic equities investment processes. CBA’s financial report for the year ended June 30th, 2018 (FY 2018) sheds lights on a resilient business, characterized by an improved EBIT (+3.7% YoY). In this wider context, the Wealth business unit reported a $736m net operating profit (+1.9% YoY), contributing 34% of the consolidated net operating income reported by CBA’s group. In Australia, banking assets have traditionally been dominated by the top four banks: National Australia Bank, ANZ Banking Group, Westpac Banking Corporation and Commonwealth Bank Group. As of 2017, the top four banks, also commonly known as the ‘big four’, held 79.0% of total banking assets. National Australia Bank led with 22.5% of market share, while ANZ Banking Group trailed closely behind with 21.0% of banking assets. Australian major banks have reported a decrease in aggregate cash profits for the 2018 full year, witnessing a fall of 5.5 % (compared to 2017) in cash profit after tax from continuing operations ($ 29.5 billion), because of the scandal that hit the banking industry. In particular, the Royal Commission inquiry in Australia has brought to light a series of malpractices in the Country’s financial sector, such as lending without doing basic checks to ensure customers could afford loans and uncovering how they have taken fees from customers’ accounts without providing them with services. Since this slew of misconduct, Australian finance companies are rushing to offload non-core business units, in order to escape the widespread expectations that a Royal Commission inquiry will result in stricter regulations, including new rules forcing banks to split. Indeed, Australia’s top four banks have sold $12 billion in assets over the past two years. 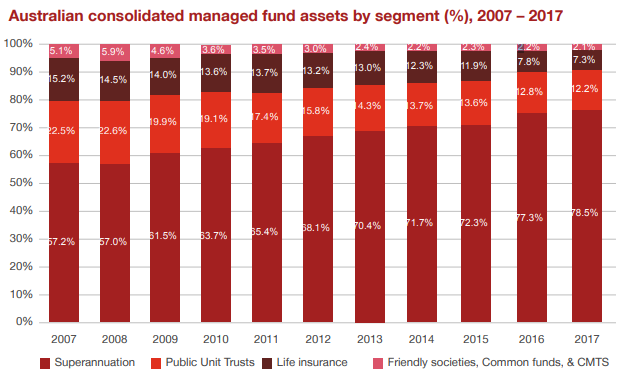 By now, looking at the Australian asset and wealth management industry by segment, an important point to highlight is the prevalence of superannuation funds among managed fund institutions, which stands at $1.4 trillion, or 78.5 % of total market share, witnessing an increase of 21.3 percentage points since 2007. As far as the asset management industry concerns, investment managers are operating in a difficult environment: even as continued growth in asset prices (especially equity index levels) serves as a tailwind, profit margins are falling globally. The analysts estimated a decline of approximately 10% since the global financial crisis, due to the pressures exerted by passive players on pricing and flows, rising regulation and technology costs, and this trend will continue. The low margins over the recent years have triggered a concentration pattern in the industry, due to greater distribution reach, a more diverse talent pool, broader product portfolios and cost efficiencies believed to be the factors which can support growth and profits. 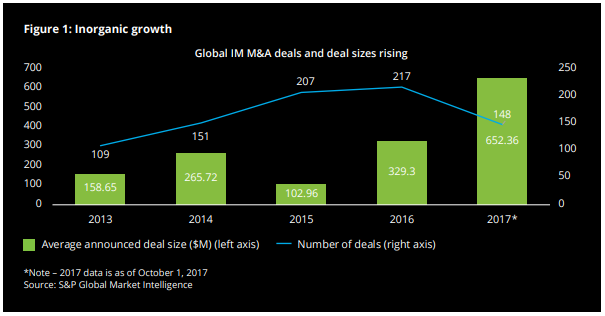 To better address this concentration pattern, the following a graph provides a clear-cut picture of the inorganic growth in the investment management industry between 2013 and 2017 (until October). The average announced deal size doubled from 2016 to 2017, following a threefold growth from 2015 and 2016: the £11 billion merger between Standard Life and Aberdeen Asset Management to create Europe’s second biggest investment manager is just a prime example of this trend. Focusing now on the Japanese market, we noticed that Japanese lenders have been long exploring different ways to diversify from their domestic lending businesses, because of constrains due to low interest rates and a shrinking population. By being the most important account in a bank’s income statement, more attention must be given to the Japanese interest rate. The following graph shows the yield curves of USA (purple line), Japan (orange line) and Australia (green line). Currently negative, the Japanese interest rate keeps industry revenues under pressure: the time interval between 2012 and 2018 has witnessed a decrease in the Japanese largest bank’s revenue, starting from $54.06 billion and ending to $45.13 billion (-2.54%, -16.5%, 12-18 CAGR). 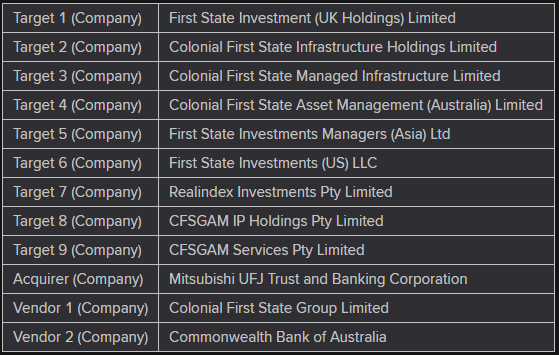 The $2.9 billion deal consists of the acquisition in cash of 100% of the shares in nine subsidiaries of Colonial First State Group Limited, which collectively, including their subsidiaries, represent the global asset management business of Colonial First State Global Asset Management (CFSGAM). The CBA’s dual track position deserve to be highlighted: in April CBA announced plans to float its non-core assets, including Colonial, but it changed its mind after MUFG’s offer, which represents 17.5x Colonial’s pro forma 2018 net profit after tax of $236m and imply a post-tax gain of about A$1.5bn for CBA, including post-tax separation and transaction costs of approximately $100m. The transaction multiple was far higher compared to what was observed for similar companies on the Australian market. For instance, in the beginning of February 2018, Hanesbrands Inc. acquired the entire share capital of BNT Holdco Pty Ltd, a Sidney-based provider of financial investment services, for an estimate of $236m in cash, which represented 10.3x the target’s company net income. The proposed transaction, which is still subject to the obtainment of the necessary regulatory approvals, is expected to close in mid-2019. On closure of the deal, the Japanese bank will have assets under management worth $727.2 billion, with A$213 billion adding from CBA. The deal will make more profitable the MUFG’s asset management and investor services business, which is predicted to contribute 7% of gross profit, up from 5% in the year ended March. MUFG’s Asset Management & Investor Services Business Group is currently pursuing its business plan for the years 2018-2021 with a main goal to become “the unparalleled industry leader in Japan as well as a global player boasting significant presence overseas’’. The company chose an external growth strategy and so far, achieved its goals by overseas deal-making. Most recent transaction of the group was a $6bn purchase of Indonesia’s Bank Danamon. In addition to that, the company performed a couple of smaller acquisitions in Vietnam, Thailand and the Philippines. Among the reasons for pursuing inorganic growth, diversification of its revenues plays a critical role. Traditionally, the primarily source of revenues for the group was corporate loans. Nowadays, however, loan-granting profits are heavily constrained due to shrinking population and, more importantly, extremely low interest rates in Japan. For this reason, the group was forced to shift away from its lending business and identify more profitable alternatives. One of such alternatives, is represented by the asset management business for which is estimated that AuM will grow in Asia–Pacific region by 8.7% annually until 2020, outperforming the global growth rate of 7%, according PwC. There are two main reasons for such an accelerated growth: in developed economies the population is ageing, in the emerging countries of the same region the middle class is growing significantly. Both phenomena should lead to the substantial surge of investors’ savings. The MUFG strategic objective is, therefore, to boost asset management capabilities by achieving up to ¥100tn ($884bn) in assets under management, strengthen product competitiveness and thus reach a dominant position in the global asset management market. As of July 2018, MUFJ Trust managed about ¥70tn and was 39th biggest asset manager internationally. 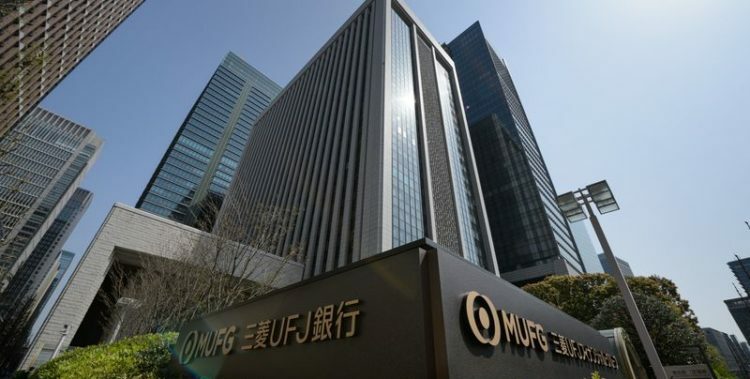 It is estimated by MUFG that after the transaction the fund will reach ¥82.2tn ($727.2 billion) AuM, taking MUFJ Trust to the 15th position as the largest asset management company on the globe and the 1st in Japan. From the perspective of Commonwealth Bank of Australia, the sale of its asset management business was a part of broader strategy of divestures from non-core businesses, which was pursued after the large-scale misconduct at the bank was exposed. In June 2018 CBA announced that its intention to demerge the wealth management and mortgage broking business. Initially, Colonial First State Global Asset Management was supposed to be a part of that demerger too. Later, when MUFG approach the CBA, it was decided to perform a spin-off of the asset management business separately from the demerger as the seller was in urgent need of increasing its cash reserves. It was a necessary step, since CBA agreed to pay record high penalty for money laundering charges which amounted to A$700 million. Markets have reacted positively to this transaction and shares of MUFG, listed on NYSE rose from to $5.84 on the day of announcement up to $6.03 the following day, which represents an increase by 3.25%. Once the transaction was announced, some analysts of Australian wealth management industry argued that this split reduces significantly the attractiveness of the remaining part of the wealth management business of CBA “as Colonial was the cherry on that particular cupcake”. Nevertheless, shares of Common Wealth Bank of Australia, listed on Australian Stock Exchange, on the day of announcement closed at 69.23AUD which was the highest value in almost 4 weeks. This is most likely due to the fact that Japanese group paid a very generous price of 17.5x Colonial’s annual net profit, far higher than multiples for similar asset management companies operating in Australia. Mitsubishi UFJ Financial Group appointed Morgan Stanley as financial advisor, while Commonwealth bank of Australia was advised by JP Morgan.